How to Add Hardscaping To Your Landscape Design LIKE A PRO! 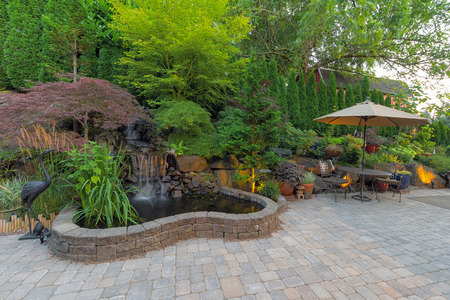 The art connoisseurs of the exterior grounds, also known as landscape architects or landscape gurus, have divided landscaping into two categories— hardscaping and softscaping. In the art of landscaping, both landscape components are intertwined harmoniously to yield an aesthetically pleasing yard. Understanding the difference between hardscape and softscape landscaping and integrating these components will not only help your yard flourish, but the mixed aspects will also complement each other and allow your yard to visually reflect your personality. Hardscaping is a form of landscape that refers to the man-made structures and materials that compose a yard, including stone paths, rocks, bricks, concrete pavers, wood, etc. Hardscaping is basically anything non-living that makes up your yard. This built-environment can maintain a small or large scale, ranging from subtle rocks to a paved pathway intertwined through a green garden. On the other side, softscaping represents a form of landscaping that is living, including plants, vegetation, flowers, shrubs and trees. This refers to the grown aspects and is usually what we think of first when we hear the term “landscaping”. Distinguishing between both landscaping terms seems fairly easy, but it’s a different challenge to harmoniously intertwine hardscaping and softscaping together as one and execute it well. Follow our pro landscaping tips and tricks to beautifully incorporate hardscaping into your landscape design. Focal Point: In art, the focal point refers to a specific point in a design that our eyes are visually drawn to. If every piece in the composition is in focus, then the focal area becomes weak. In the art of landscaping, this is also true. You want to create a a focal point within your landscape to capture the viewer’s gaze. Identical to a painting, the focal point in landscaping could be represented by color contrast, value contrast (dark against light), details, or a center piece (like a fountain or curved pathway). The goal of a focal point is to create a resting place for our eyes. One or two focal points with hardscaping is ideal. Limit Straight Lines and Avoid 90 Degree Angles: Incorporating too many straight lines or right angles within your landscaping can produce an unnatural look. Instead, intertwine hardscape material, like stones and rocks, in a curved pathway and blend with curved flowers and trees to retain visual appeal. This will help your yard appear less-planned, more natural, and visually more appealing. Plan for Drainage: When incorporating hardscape into your yard, it is important to stay practical and consider a plan for drainage in order to avoid flooding or water deprivation. Planning drainage installation is just as important as planning your actual hardscape. Extend the Greenery: If you are blessed with greenery aligning your backyard, work with your natural setting! Incorporate your walkway and landscaping to align and be cohesive with your existing greenery and trees. This will create a wavy and organic atmosphere as the areas will blend together like a natural forest. Our professional landscape architects at Mansell Landscape can help you with all your landscaping needs. Landscaping is an art, and one that we know well! If you are interested in hardscaping, softscaping, or lawn care maintenance, call us today at (770) 517-0555 or contact us here.